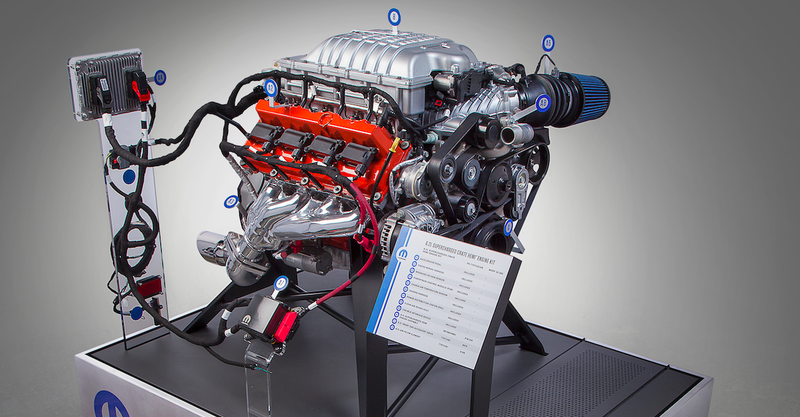 There’s good news for everyone who’s been prowling Copart for wrecked Dodge Hellcat Chargers and Challengers: Fiat Chrysler’s Mopar division just announced a new 6.2-liter supercharged crate engine kit called “Hellcrate.” Because every car deserves 707 horsepower. Have you been yearning to put your project car’s antiquated chassis to the test by stuffing an enormous, overpowered motor under the hood? Of course you have! We’ve all been there. 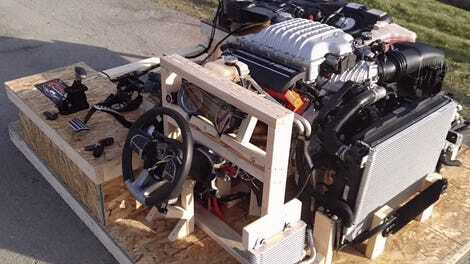 The kit includes a powertrain control module (PCM), power distribution center, engine wiring harness, chassis harness, accelerator pedal, ground jumper, oxygen sensors, charge air temperature sensors and fuel pump control module for the 6.2-liter supercharged Crate HEMI Engine. The PCM is unlocked and set to the factory 707- horsepower calibration. Mopar says its engineers optimized the Hellcrate Hemi Engine Kit for use with manual transmissions, and that the engine also requires a Front End Accessory Drive Kit, which includes things like a power steering pump, belts, an alternator, pulleys and more. The brand doesn’t mention pricing on that FEAD kit. While “first-ever supercharged, 707-horsepower factory-backed crate engine kit” seems like an awfully specific thing to brag about being first to, and the price tag isn’t exactly cheap, it’s hard not to find a 700+ horsepower crate engine with a three-year/unlimited mileage warranty at least somewhat awesome. I’d love to throw one in my Grand Wagoneer. It think it would fit.